© The State of Victoria, Department of Primary Industries, 2008. This publication is copyright. No part may be produced by any process except in accordance with the provisions of the Copyright Act 1968. Requests to reproduce or communicate this material in any way not permitted by this licence (or by the fair dealing provisions of the Copyright Act 1968) should be directed to the Print & Reference Service Manager, GPO Box 4440, Melbourne 3001. Preferred way to cite this publication: Department of Primary Industries (2006). Regional Fisheries Consultations Meeting Outcomes - Fish Stocking, Fish Population Surveys and other Recreational Fisheries Management Issues 2007. 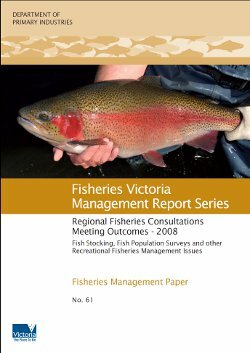 Fisheries Victoria Management Report Series No. 61. Authorised by the Victorian Government, 1 Spring Street, Melbourne, Victoria 3001. Published by the Department of Primary Industries. Copies are also available from the DEPI website. Disclaimer: This publication may be of assistance to you, but the State of Victoria and its employees do not guarantee that the publication is without flaw or is wholly appropriate for your particular purposes and therefore disclaims all liability for an error, loss or other consequence which may arise from you relying on any information in this publication. This report cannot be used in a court of law. Fishing laws change from time to time. It is your responsibility to ensure that you are acting within the law. If you are in doubt seek independent legal advice. For other information contact the Customer Service Centre (telephone 136 186 or www.dpi.vic.gov.au/fishing/). Fisheries Victoria annually stocks an average of 1.1 million salmonid and native fish into Victorian public water for recreational purposes. Stakeholders have input into the process that determines what species go where and when through their participation in the annual regional consultative meetings (CONS). CONS provides a forum for discussion on fish stocking regimes, fish population surveys and other related recreational fisheries management issues. Meetings involve representatives from Fisheries Victoria, Victorian Recreational Fishing Peak Body (VRFish), Water Management Authorities, Catchment Management Authorities(CMAs), Department of Sustainability and Environment (DSE), and other organisations connected with recreational fishing. Identify current fishery management issues. The meetings are the focal points for information from various sources, including requests and viewpoints from angler. Draft reports of the meetings are prepared by The Victorian Fisheries Authority and circulated to participating stakeholders for comment prior to publication of this document. The Department acknowledges and commends the important contribution made by stakeholders who provide their time to prepare for and attend these meetings. The stocking plan for salmonids developed from the 2007 CONS meetings identified a requirement for 339,510 fish to be stocked if favourable environmental conditions occurred. In total, only 189,518 (or 56%) of the scheduled salmonids were stocked. reduced numbers and capacity of waters available for stocking. A 2006 risk assessment at Snobs Creek production facility identified reduced water flow and increased water temperature as major threats to salmonid production. A mitigation measure undertaken was the instillation of a direct oxygen injection system which became operational in February 2007. Extreme conditions resulted in the loss of nearly 50% of brown trout fingerlings. Sufficient rainbow trout numbers survived to stock all the available waters. A total of 18 salmonid waters scheduled for 2007 stocking were deemed unsuitable throughout the year. Some of Victoria's best known trout lakes including Newlyn Reservoir and Hepburn Lagoon near Ballarat, Lauriston and Malmsbury Reservoirs near Kyneton and Fyans Lake in the Grampians were not stocked. Of those waters that received fish, many had their scheduled numbers reduced in response to low water. A number of unscheduled stockings occured during 2007. An additional 270,000 rainbow trout fry from the 2007 spawning were successfully raised and through consultation with stakeholders, released into Eildon Lake, Bellfield Lake. Glenmaggie Lake and Eildon Pondage. These fish were not included in the total of stocked fish. The stocking plan for natives is developed from the previous years CONS report. CONS 2006 scheduled 1,013,400 natives to be stocked in 2007 if favourable environmental conditions occurred. Due to significant shortfalls in supply of both Murray cod and golden perch only 668,985 fish were stocked. The 2008 native stocking plan developed from the 2007 CONS meetings scheduled a total of 1,001,150 native fish for release. Due to a shortfall in the supply of golden perch, only 833,250 were stocked. Stocked fish comprised 257,250 Murray cod (6,800 more than scheduled) and 565,700 golden perch (169,000 less than scheduled). Small numbers of silver perch and trout cod were also stocked. Of the 47 waters scheduled for stocking in 2008, 13 were deemed unsuitable. The 2009 target will be determined once the 2009 salmonid numbers have been identified at CONS. One of the 2006 election commitments of this Government was a 30% increase in the numbers of fish stocked for recreational purposes by 2010. Using the average of 1.1 million fish over the past 8 years the 2010 target for recreational stocking is just under 1.5 million. This is to be across both the salmonid and native fisheries. Development of several new fisheries is currently being negotiated and the 2008 target is 1.3 million. This will be followed by 1.4 million in 2009 and 1.5 million in 2010, therefore reaching the 30% increase. While no-one can predict what environmental conditions will be experience in the coming year, the focus of the CONS process continues to be the enhancement of recreational fishing opportunities. Applications for 12 new waters have been supported as well as the addition of three previously stocked waters, the most significant of these being the Nagambie Lakes system. Support was also given for a further 10 waters to be enhanced with either new species or numbers. Only two waters were removed from the stocking plan; Waranga Basin because of poor returns to anglers and Tarwin River (East Branch) because of the presence of endangered species. Call DPI Customer Service Centre on 136 186 or to report fisheries offences call 13FISH (133 474). The salmonid and native stocking tables included in appendix 1 detail the planned public water stocking rates for the 2008 salmonid and 2009 native stocking seasons and are determined through the regional stakeholder consultation process (CONS). The proposed figures are based on the projected water levels for each of the identified water bodies. Prior to stocking, each water is assessed and where required fish numbers adjusted according to the prevailing conditions. Any figures shown in brackets are the maximum stocking rates approved if conditions substantially exceed projections. Proposed stocking rates are also subject to budget availability from a combination of recurrent DPI funding and funding provided from the Recreational Fishing Licence trust account. Following each regional stocking table a list of waters that are affected by ongoing adverse environmental conditions and/or water management arrangements is provided where relevant. These waters have been temporarily removed from the main body of the overall stocking plan. Upon return of agreed acceptable environmental conditions and/or water management arrangements, these waters will be transferred back to the stocking plan and fish numbers, species mix and sizes will be determined in accordance with the Fisheries Victoria Stocking Policy. The Family Fishing Lakes Program stocks readyto- catch advanced yearling rainbow trout into suitable impoundments. The primary purpose is to provide a recreational fishing experience to junior anglers and anglers with restricted mobility. The waters selected are close to populated areas with good access. Releases of rainbow trout are aligned with the second and/or third term school holidays plus any Fishing Week or junior fishing clinic events. This generally coincides with water temperatures best suited to the survival of trout. Rainbow trout are stocked as they are ready to catch and easier to catch by inexperienced anglers. Each year, any additional 2 and 3 year old rainbow trout broodstock deemed excess to requirements are distributed across the Family Fishing and Premier Lakes programs. Advanced yearling rainbow trout generally range in weight from 150 – 200 grams, Premier fish are 1 kg or larger and ex-broodstock can be in excess of 3 kg. The numbers of fish available for allocation to the Family Fishing and Premier Lakes programs may vary in response to environmental or other changes. Recognising that recreational fishing is a major social and economic contributor to Victorian communities, the Government aims to boost participation in this popular recreational activity. Five of the Family Fishing Lakes have been selected to be developed as Premier Lakes as part of the Go Fishing in Victoria initiative. Premier Lakes will offer access for anglers of all ages and abilities, and will also feature family friendly facilities such as toilets, BBQs, picnic tables and playground equipment to encourage families and new anglers to go fishing. Premier Lakes will be stocked with larger 'Premier' rainbow trout (>1 kg) at least four times per year (subject to suitable water conditions). This is in addition to the normal advanced yearling trout. Stocking of 'Premier' rainbow trout at Lillydale Lake, Eildon Pondage and Kennington Reservoir commenced in 2007, with Hyland Lake, and Jubilee Lake commencing in 2008. The five Premier Lakes will be the focus of Family Fishing Events - fun days when families and kids can learn to catch a fish. These events are planned and run in partnership with VRFish, local angling clubs, local shires, Fishcare volunteers and other stakeholders. In 2006 an inaugural Family Fishing event was held at Lillydale Lake. In 2007, two Family Fishing events were held at both Eildon Pondage and Kennington Reservoir, and a further event was held at Lillydale Lake. Almost 1500 children from over 740 families registered and participated at these six events. Evaluation results indicate that these events have been very successful in providing participants with an increased interest in recreational fishing (table below). To cater for more experienced anglers, sections of the Hopkins, Goulburn and Kiewa rivers will be developed and promoted as Premier Rivers. The rivers have been chosen for their existing riverine environments and high recreational angling values. Funds will be invested into on-ground works that improve access for anglers and provide additional recreational fishing facilities. Following this an information package will be developed for each of the river stretches identifying key access points and the type of fishing experience and facilities that they provide. No additional stocking is planned for Premier Rivers. More information available on the Go Fishing in Victoria initiative (including Premier Lakes, Family Fishing Events and Premier Lakes). The ongoing drought has continued to affect most of our lakes and streams throughout regional Victoria. Unlike 2007, rainbow and brown trout fish production at Snobs Creek hatchery has been assisted by small but frequent rain events in early summer which have maintained better water temperature, levels and dissolved oxygen. Similar to 2006, a stocktake of salmonids (rainbow and brown trout plus Chinook salmon) was carried out in November 2007 which identified additional "excess" stock. These fish were subsequently released into several waters throughout Victoria during November and December 2007. In response to forecasts of likely good spring rains last year, the hatchery successfully tested its capacity to grow fish quickly for drought recovery. Additional rainbow trout were spawned last autumn. Unfortunately significant rains did not occur. These fish were stocked into Lake Glenmaggie (100,000) Lake Eildon (100,000) Eildon Pondage (20,000) and Lake Bellfield (50,000). The chinook salmon breeding program has been strengthened in an attempt to overcome shortfalls caused by the current environmental conditions. Broodstock numbers have been increased from the 2007 spawning and these fish will become our 2009/10 broodstock. Due to holding back fish for broodstock and production difficulties, the number of Chinooks released in 2007 fell short by about 30% and no fish are available for stocking in 2008. Two Family Fishing events will be held at each of the five Premier Lakes in 2008. Chinook salmon production will continue to be difficult given present and expected environmental conditions. The number of Murray cod bred on site this yearwas about 50% of our annual requirement. The remainder were purchased from private suppliers in larvael form and on grown on site before distribution. Hatchery management is being strategically directed towards quickly responding to improved environmental conditions which meets our 2008 rainbow and brown trout stocking requirements. From 2009, stakeholder stocking proposals forwarded to VRFish or from VRFish to Fisheries Victoria for consideration at CONS do not need comments on each and every water unless seeking a variation from the previous year. If seeking a variation, record the water and the proposed variation (species mix, size or number) and the justification for the proposed change. If a new water is proposed, all relevant information should be provided including water managers support, any access issues, the location and characteristics of water body, photographs any any other relevant information. RESPONDING TO THE IMPACTS OF DROUGHT AND ITS CONSEQUENCES FOR RECREATIONAL FISHERIES. The Victorian inland recreational fisheries face significant pressures due to ongoing drought conditions. This policy provides guidance for the Department of Primary Industries in responding to the impacts of prolonged periods of drought such as significantly reduced water quantity, quality and flow. It identifies roles and responsibilities, policy principals and mitigation measures to be used. Purposes has been prepared and a copy is included as Appendix 2. Fisheries Victoria has developed a strategic plan for the program and is in the process of implementing these initiatives. Fisheries Victoria has developed a Murray Cod Foundations Paper that outlines future challenges that face the Murray cod fishery, strategies for management moving forward and opportunities for research and development. Lake Bullen Merri has long been considered an important recreational salmonid fishery by DPI. In 1982, an aerator was installed on the western shore of the Lake by DPI, which was subsequently relocated to the southern shore several years later. The aerator has been operating during the warmer months in an attempt to address water quality issues caused by stratification. To assess the effectiveness of the aerator, researchers were commissioned to monitor water quality parameters of the lake over a two-year period from January 2005 to December 2006. Preliminary research results indicate that the aerator had no impact on the stratification of the Lake with respect to dissolved oxygen, temperature and light intensity (penetration). The final report is expected to be completed and released in 2008. Fisheries Victoria is not the responsible water manager and has no authority under legislation for the ongoing management of the Lake. Fisheries Victoria no longer supports the operation of the aerator and it has been decommissioned. As a result of ongoing dry conditions and projected storage levels for Lake Mokoan, it was determined that a biomass reduction exercise was required in the lake to minimise the likelihood of a large scale fish kill. DSE engaged the services of a contractor skilled in the large scale collection/harvest of fish. Fisheries Victoria were contracted to undertake the transportation of fish. Two translocation events occurred, the first in December 2007 and the second in April 2008. Various types of nets were utilised. In total, 2164 golden perch (average weight 447 grams) and 51 Murray cod (average weight 5.44 kilograms - maximum 12.5 kg) were translocated. Fish were released in several sites in the mid Goulburn River and Lake Hume. All fish released into the Goulburn River from the April captures were externally tagged. Approximately 250 carp were removed. DSE will determine whether further harvesting is required. A Ministerial Taskforce for Bushfire Recovery allocated $455,000 for a three-year project on 'Supporting the recovery of the recreational fishery industry in bushfire damaged areas'. Undertaking strategic fish stockings (where appropriate) to aid the recovery of fish populations. In 2007 a broadscale assessment (presence/absence survey) of fish stocks was undertaken across the burnt area - 75 sites were surveyed in six catchments. A survey was developed to determine what would motivate fishermen to fish in the bushfire area and what can be done (by Government Agencies) to encourage more to return to the area. This survey is ongoing. The next steps were to undertake detailed population studies at selected locations to compare the impacts of the 2006/07 and 2003 bushfires. This took place in April and May 2008 to maximise the use of historical data. An assessment of the social and economic impact of the bushfire on recreational fisheries in communities in the bushfire area will also be conducted during 2008/09. The Protocols for the Translocation of fish in Victorian Inland Public Waters document is available on the DPI website. The protocols have been developed in accordance with the Guidelines for the Translocation of Aquatic Organisms in Victoria and describe the measures that apply to the translocation of native and salmonid species for recreational fishing and conservation purposes. The protocols take account of the substantial benefits associated with wellmanaged stocking programs while providing a framework to minimise the potential risks associated with translocations of this nature. Many recreational fisheries are severely affected by the continuing dry conditions and are experiencing very low water levels. Fisheries Victoria has renewed the Fisheries Notice that bans the removal of dead timber, fallen or standing, from below the high water mark of nominated impoundments. The current Fisheries Notice expires on 26 March 2009. How best to permanently protect fish habitat is currently being investigated by FV. A process of preparing 10 inland fishery management plans is now well under way. The management plans are being developed on a geographic basis and align with the 10 Catchment Management Authority (CMA) regions in Victoria. Each inland plan provides management direction for their fishery for a 5 year period. The first three inland plans, the Glenelg Hopkins Fishery Management Plan, the North East Fishery Management Plan and the West Gippsland Fishery Management Plan have been declared. Corangamite Fishery Management Plan is near completion and consideration for release. The Draft Western Port and Port Phillip Fishery Management Plan and the Draft Wimmera Fishery Management Plan are expected to be released for public comment in November this year. People are encouraged to provide their views on the draft plan in writing to Fisheries Victoria once the draft is released. The released plans, draft plans and further information is available on the DPI website by following the links to Managing Fisheries or by contacting the Department of Primary Industries Customer Service Centre on 136 186. All management plans are being prepared with oversight from an independently chaired steering committee that may include representatives from VRFish (2 nominees), CMAs, Victorian National Parks Association, Indigenous interests, Fisheries Co-Management Council, water authorities, Department of Sustainability and Environment and Fisheries Victoria. The public will have an opportunity to have input into the preparation of the management plans through public meetings and by providing comment on draft management plans. Fisheries Victoria have worked with members of VRFish, representing the recreational fishing community, to prepare a Stream Classification model which can be used by fishery managers to classify all rivers, streams and impoundments across Victoria as either 'salmonid', 'native', or 'mixed' fisheries. To inform other government natural resource management agencies how various waterways will be managed, from a fisheries based perspective. Develop a new classification system for rivers and streams that will classify waters as either salmonid, native or mixed fisheries. Secure, grow and share potential benefits from Victorias inland fisheries with the wider community. Formalise future fisheries management objectives. Aid in the promotion of Victoria's salmonid, native and mixed fisheries for the benefit of local communities. A draft model has been completed and consultation has occurred with recreational anglers in the North East of Victoria during May 2008. A public submission period for suggestions on the model is open until 30th September 2008. The classification of all Victoria's rivers, streams and impoundments, using the new model is expected to be completed by the end of 2009. The Regional Fisheries Consultations Meeting Outcomes reports (2005 to 2008) can be viewed online at the DPI website, www.dpi.vic.gov.au/fishing. The 5th edition of the 'Guide to Inland Angling Waters of Victoria' is available on-line on the Department of Primary Industries website. The revised edition includes more information on the various government agencies responsible for managing fish and fish habitat, including water authorities and catchment management authorities. Trout are one of the most targeted species in inland Victorian waters. Nearly half of all trout harvested in Australia are caught in Victoria. Trout have been stocked in Victorian waters since the 1860s. Since 1960, over forty-one million trout have been released in numerous lakes, rivers and streams across the state. Today, management practices provide an integrated approach to freshwater fisheries management. Fisheries Victoria utilises a combination of regulation, stocking and habitat advocacy to manage trout fisheries. Communities. The brochure is available in pdf form at www.dpi.vic.gov.au/fishing. Alternatively contact the Customer Service Centre on 13 61 86 to request a printed copy. Almost half of the angling effort in Victoria occurs on freshwater lakes, rivers and streams, resulting in major economic and social benefits to regional communities. Murray cod, golden perch and Australian bass are the more frequently targeted native species. the Benefit of Provincial Victoria. Contact the Customer Service Centre on 13 61 86 to request a printed copy. This water has been periodically stocked with brown and/or rainbow trout for several decades but there has been limited return of these fish to anglers. FV surveys also failed to capture any trout and the fate of the stocked trout is unknown. A revised survey strategy including netting of the lake plus stock assessments of inflowing streams with electrofishing was developed for implementation early 2008. All stocked trout since 2003 have been marked to distinguish them from naturally recruited fish from the system. The objective is to determine if the trout survive in the lake and to identify any upstream movement of trout from the lake. The initial assessment and report on the lake and the inflowing streams is due for completion prior to 2009 CONS (March 2009). Narracan Lake and inflowing streams. To determine the success of stocking brown and rainbow trout into Narracan Lake through presence/absence surveys. Surveys are to include inflow/outflow streams to locate any marked fish that may have migrated from the lake. Cowwarr Weir and adjacent Thomson River system. No survey is to be undertaken until a Southern Rural Water application for Australian bass is prepared and approved by the Translocation Evaluation Panel. An extensive fish survey is then required to determine presence/absence data for all species prior to proposed stocking of Australian bass. The survey may also determine if there is sufficient Australian bass present in the system to use as future broodstock. 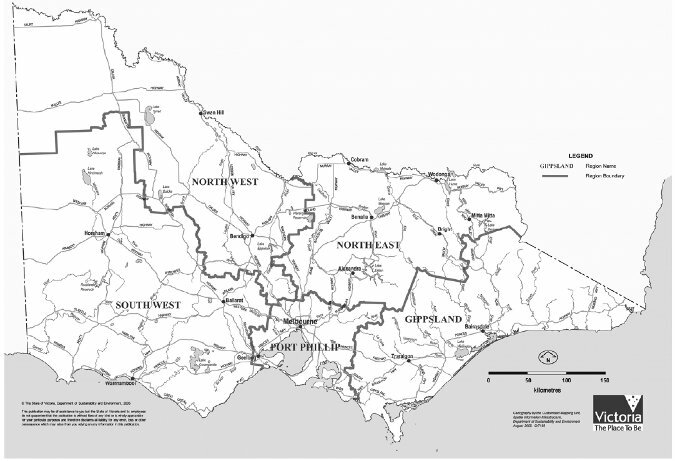 Fisheries Victoria suggested that stakeholders from the area should actively investigate the availability of any off-line or decommissioned waters that may create new fisheries. In response to a revised stocking regime with the inclusion of rainbow trout in 2008, Bluerock Lake is to be nominated in 2009 for a stock assessment to monitor results. Action: Bluerock Lake to be nominated for a stock assessment at 2009 CONS. VRFish (Region) will investigate the suitability of Garfield Lake as a proposed Family Fishing Lake and assist the Garfield Recreation Reserve Committee of Management (the proponent) with a TEP Initial Screening application if required. Action: VRFish will notify FV on the suitability of the water and assist with any Translocation Evaluation Panel application. Outcome: VRFish investigation reveals that Garfield Lake is a raised 'goose nest' dam with steep sides and is used for irrigating a multi use recreation area. Water levels are presently low and unsuitable for stocking. The Shire of Cardinia are supporting the Committee of Management in developing the area, including infrastructure for recreational angling with a changed water management regime. It is unlikely that this water will come on line for any stocking in 2008 but VRFish will monitor and where possible, assist. Action: Fisheries Victoria will negotiate an appropriate stocking regime with VRFish upon approval and include in 2008 stocking plan if finalised in time. A water in the Poowong area may also become available. Details are unclear but local VRFish will investigate. Action: Local VRFish representatives will investigate potential availability. The outcome will be relayed to VRFish Executive and Fisheries Victoria with a view to developing a new fishery. John Cameron from Southern Rural Water has expressed interest in developing Cowwarr Weir as a recreational fishing alternative. Australian bass have been suggested as the most desirable species. Action: Southern Rural Water (as the proponent) with the assistance of Fisheries Victoria to submit an Initial Screening application to the Translocation Evaluation Panel. Expected alteration to the water management regime at Narracan Lake may lead to greater fluctuation in levels throughout the year. The impact of this altered management regime on recreational anglers and other users of the lake is unknown at this time. Southern Rural Water have received RFL Trust revenue to build a fishing platform at Heyfield Racecourse Lake. The platform will be constructed in 2008 and provide access during fishing events for people with limited mobility. The presence, absence and relative abundance of recreational native fish stocks in the Goulburn River near Seymour is primarily based on anecdotal reports. Information is required to determine current fish stocks and benchmark the fishery to evaluate the effectiveness of the introduced stocking regime. The initial sampling round has been completed where three sites were electrofished in the Seymour area. Carp, rainbow trout, redfin and river blackfish were sampled. Anecdotal reports of native fish captures have been received from the area around Mitchellstown, which will be included in the next round of surveys. To date there has been no Murray cod or golden perch caught in surveys. Deeper water sampling difficulties are likely to reduce native fish captures. Alternative survey methods will be trialled. Who catches what, where, when and how? How long do stocked trout remain in the pondage before they are caught? Where do anglers come from and how much do they spend on their visit to the pondage? How satisfied are anglers with their fishing experience at the pondage? Nearly 4,000 anglers were interviewed in the 200 interview sessions of the creel survey. It was estimated that anglers fished for nearly 50,000 hours and just over a third (36%) of the brown trout and nearly half (48%) of the rainbow trout stocked into the pondage over the period of the survey were caught by anglers. Based on the number of returns and the date of the tagged fish reported by anglers, the majority of the fish were caught within the first few months of their release date although some fish remained in the fishery for up to 18 months. The tag returns also highlighted that some fish move out of the pondage and are caught in the river downstream. The pondage is popular with people who do not fish often as the majority of interviewed anglers were inexperienced and claimed to fish less than once per month. There were some regulars who fished the water on a routine basis (13%). The majority of pondage anglers are male and angler ages varied. Nearly one quarter of interviewed anglers (23%) were young (<18 years) or older (>70 years). The most common angling methods used in the pondage were bait (60%), a combination of methods (24%) and lure (14%). Fly fishing was the least popular method with only 2% of the interviewed pondage anglers claiming this as their principal angling method. The most successful methods of fishing (highest catch rates) were lure and bait. What fish species are in Lake Hume? How healthy are these populations? What contribution does fish stocking make to anglers' catches? Six fish species were captured in the surveys and included carp, redfin, golden perch, brown trout and Murray cod. The largest Murray cod was 475 mm in length (average 408 mm) and the maximum weight was 1,638 gms (average 1,194). The largest trout was 505 mm in length (average length 357 mm) and 1.7 kg in weight (average weight 566 gms). The largest golden perch was 665 mm in length (average 325 mm) and 7.3 kgs in weight (average 753 gms). The largest redfin was 395 mm in length (average 243 mm) and 1.3 kgs in weight (average 284 gms). It was estimated that anglers fished for a total 63,622 hours and caught 154,208 redfin, 477 brown trout, 1,339 carp and 246 golden perch from Lake Hume. Of these, anglers released an estimated 97,635 redfin and 100 trout. Catch rates for each species varied in each arm of the lake. Redfin catch rates were higher in the Murray River arm and brown trout catch rates were higher in the Mitta Mitta arm. These results indicate that Lake Hume is primarily a popular and productive redfin fishery. Although brown trout, golden perch and Murray cod have been stocked into the lake and were present in the fish samples, they did not appear in anglers catches in any significant numbers. These fisheries appear to be generally underutilised by recreational fishers. Trial stockings of trout had little impact on angler catches and were estimated to have provided an additional 75 trout to the overall annual angler harvest. The trout in the lake were in fair to poor condition and this may have reflected the low water levels present in the lake at the time of the study. The amount of summer trout habitat may not only impact on trout condition but be a limiting factor to the trout fishery. Anglers don't successfully target trout in the warmer months. The summer trout fishery is underutilised in Lake Hume. The lake is an important recreational fishery to the surrounding local communities. Nearly 70% of anglers interviewed were from Wodonga, Albury or Lavington. In 2007 VRFish proposed the Wodonga Wetlands area for both salmonids and natives. The outcome from 2007 CONS was that both locations (unspecified) within wetlands were supported pending management authority advice on access, water levels and water quality. Regional Fisheries Victoria and VRFish were to assess the advice provided by the water manager. VRFish would then submit an Initial Screening application for golden perch to the Translocation Evaluation Panel. A new proposal for 2008 CONS is to include a second area known as Wodonga Gravel Pits. This area is also managed by the local shire. Liaison is continuing with all stakeholders on both areas as potential fisheries. VRFish will submit Initial Screening applications to TEP when appropriate. Through the CONS process, Fisheries Victoria proposed establishing a stakeholder advisory group to develop a management strategy for Nagambie Lake, Goulburn Weir and possibly Waranga Basin in line with the Goulburn-Eildon Region Fisheries Management Plan (GERFMP), in particular objectives Part 2.8 and 3.2. Issues for consideration were previous research data, fish passage and barriers, water management regimes, weed control and collectively managing all waters as one. redfin and spiny freshwater crayfish'. It will include short term actions such as recommencement of a stocking program for native species and longer term objectives such as 'identify and where possible address limiting factors in the fishery'. The proposed stocking rates for 2009 are 200,000 golden perch and 50,000 Murray cod (pending TEP approval). In line with the GERFMP definition of Nagambie Lakes, the fish will be distributed in Lake Nagambie and Goulburn Weir as well as connecting waters of the Goulburn River. Unspecified numbers of 2 and 3 year old future brown and rainbow trout broodstock deemed excess through a selection process. An additional 20,000"catchable" yearling or bigger brown and/or rainbow trout, if available, will be released into Eildon Pondage during the salmonid closed season from early June to early September. This is to offset the perceived added utilisation of Eildon Pondage while the Goulburn and other local river are closed to salmonid fishing. 5,000 fish per month will be released and the species mix and size will depend on the fish available at the time. The supply of these additional fish will not impact on the scheduled state-wide delivery of the annual stocking plan. A local recreational fishing/business representative will attend CONS 2009 and report on the outcome of the trial. (2008 comment taken directly from stocking submission) In reference to a project in the North East Area as mentioned in the VRFish Notes, looking to the Future of the Goulburn River the GVAAC is suggesting that a Fish Ladder be constructed at the Goulburn Weir Wall as soon as possible to complete the flow for Fish to negotiate the upside waters ( This project was to be built when the Weir was made in 1888). Alan Chisholm (VRFish), Eain McRae (FV), Greg Brodie (FV), John Cooke (DSE), Adam Muir (DSE). This survey was commenced in 2005. It obtained social information regarding angler target species preferences and satisfaction with current management arrangements to assist in consideration of any need to change current management arrangements when the Bendigo Fisheries Management Plan is reviewed. Project has been completed and final report has been published. Lauriston Reservoir supports a considerable population of roach, an introduced fish species. The objective of this study is to determine the impacts of stocking triploid brown trout on the roach population. Triploid trout are not capable of reproducing and continue to grow larger when diploid (normal) trout are entering reproduction, This provides larger fish sooner. In this case roach may provide the food to produce 'trophy' sized trout and in the process the trout may impact on the roach population. Fish population surveys were undertaken prior to releases in 2006 to establish existing fish stocks. Equal numbers of triploid and diploid brown trout were then released with each type distinguishable by a different mark. The intention is to monitor the progress of these stocked trout to compare growth performance. Three attempts have been made to produce triploid trout. The first batch was successful and stocked in 2005. The second attempt in 2006 failed. Triploidy has been confirmed in fish from the third attempt (2007) and these will be stocked in 2008. The first batch of triplod brown trout and diploid brown trout were stocked in 2006 and surveys have confirmed the survival of fish from these releases. The project is on-going. Changes in growth between the trout 'types' will only manifest after the fish begin to mature (2 to 3 years of age). Until this time both stocks would be expected to grow at the same rate and no growth difference would be expected. The project will monitor roach populations and the continued presence of the stocked trout through routine sampling. Tullaroop Reservoir has been stocked with 5000 brown trout in 2004 and 2005 with each year identified by markings. There are ongoing questions about the contribution of stocking compared with any natural recruitment of trout into the lake from the inflowing stream. To determine contribution of stocking to the trout population a netting survey was proposed in the 2007 CONS and undertaken in early 2008. A December 2007 survey used mesh nets to sample the fish population. The survey sampled a total of 12 brown trout and eight redfin. Non clipped brown trout contributed 50% of the total brown trout catch. The trout captured averaged 564 millimetres in length and 2444 grams in weight with the largest trout 577 mm long and weighed 2700 grams. The results of this survey are consistent with the previous surveys of the trout population structure taken in 1989, 1997, 1998 and 2000. These surveys also showed a stock dominated by larger, brown trout. Bealiba Reservoir Fisheries Victoria Extensive stock assessment to monitor existing fish populations prior to implementing a new stocking regime. Inglewood Reservoir Fisheries Victoria Extensive stock assessment to monitor existing fish populations prior to implementing a new stocking regime. This project follows on from an RFL funded stocking trial in five waters in the Kerang area. The five waters are Boga Lake, Charm Lake, Kangaroo Lake, Reedy (1st) Lake and Kow Swamp. Each was commercially fished prior to an RFL funded commercial licence buy-back in late 2002. The four year RFL funded stocking trial commenced in 2003. A combination of dart tagged yearling Murray cod and chemically marked fingerling golden perch were released annually with the expectation that angler feedback would give an indication of the contribution stocking was making to the overall fish population and angler returns. Limited data has been forthcoming from tagged Murray cod while no data is available for golden perch. Indications from the small number of returns from dart tagged Murray cod are that movement throughout the system is occurring. Data from the chemically marked golden perch has not as yet been captured as it is an internal dye that can only be obtained through analysis of the otolith bones from captured fish. Duration – 2007 to 2013. The contribution of previous Murray cod and golden perch stocking on existing fish populations. The effect on overall fish populations of a revised stocking strategy. The effect of altered stocking rates on angler captures and satisfaction. Reedy Lake (First) - stocking rate of 5,000 chemically marked golden perch and 500 dart tagged yearling Murray cod retained. RFL funding for the first three years of the project has been approved, funding stock assessments, analysis of fish samples, angler surveys and production of a report. Fish to be stocked are funded by Fisheries Victoria. The project commenced in 2007 with annual reports being produced and a final report after the completion of the project. It was proposed that Fisheries Victoria should reintroduce "pre-CONS" meetings the night before with all regional angling clubs invited. There was minimal support for those in attendance. Fisheries Victoria advised that VRFish was responsible for representing and co-ordinating recreational angler views at CONS. If Fisheries Victoria input was required at any proposed meeting, approval should be requested in writing through VRFish Executive to Fisheries Victoria. There were no surveys identified for 2007. Karkarook Lake Fisheries Victoria Stock assessment to determine survival and growth of stocked RT in response to limited stakeholder feedback. No issues were raised by Fisheries Victoria. VRFish indicated that Frankston Reservoir may be decommissioned in the near future and potentially could be available for development as a new fishery. VRFish will monitor the situation. Robert Gibb, Wayne Fulton, Brian Mottram, Duncan Hill, Craig Murdoch, Murray Burns, Tash Wills, Paul Shea, Heath Cameron, Troy Duthie, Cameron McCallum. Jarrod Obst – Glenelg Hopkins, Greg Fletcher – Wimmera. Rocklands Reservoir has been very low for several years due to the drought. Little was known of the fish stocks in the lake, especially the trout that had been stocked before the water levels became too low. A netting survey of Rocklands Reservoir was undertaken to investigate the current fish stocks in the lake. A December 2007 survey of Rocklands Reservoir captured five species of fish including brown trout, catfish, redfin, goldfish and carp. All these species have been introduced to the lake. The six brown trout averaged 410 mm in length and 776 grams, the nine redfin had an average length of 301 mm and 441 grams, the two catfish averaged 430 mm in length and 802 grams. Catfish are not endemic to the Glenelg catchment. Different strains of fish can sometimes show differences in performance, either in catchability and/or longevity in the fishery. This project is an investigation to compare the performance of the Snobs Creek strain rainbow trout with a Tasmanian strain of rainbow trout. The original project was scheduled to be undertaken in Lake Wendouree (Ballarat) but low water levels from the drought meant the trial had to be undertaken in another location and Lake Wartook was eventually chosen. The two separately marked strains of trout, of the same age and size, have been stocked simultaneously into the lake in 2006 and 2007. The performance of the strains is to be compared by sampling the lake on a routine basis and compare relative abundance and growth of the two stocks. Two netting surveys have been undertaken in the lake and only one rainbow trout has been captured. The 2006 rainbow trout were much larger than normal at the time of release because of time elapsed selecting a suitable water and the need to then seek approval for the translocation of rainbow trout into Wartook Lake. Anecdotal reports suggest these larger fish entered the fishery straight away with high capture rates by recreational anglers in the period just after their release. The initial results of the netting survey would suggest that few if any of the initial stocking of either rainbow trout strain remain in the lake. There is insufficient information available to make a decisive comparison between the two trout strains. Anecdotal reports of recreational captures of the 2007 stocked rainbow trout were received in April 2008 and regular sampling is planned to monitor these fish. Routine netting surveys are undertaken in these lakes to monitor the condition factor of stocked salmonid species. The current salmonid condition is within those seen previously from the lakes. Routine surveys will be conducted as required. Routine netting surveys are undertaken to monitor length frequencies and condition factor of stocked bass species. Netting has not yet been undertaken in 2008. The routine surveys will continue. Wartook Lake Fisheries Victoria Continuation of evaluation on rainbow trout genetic strain trial. There is a requirement to extend this trial in response to most of the larger (800 gram plus) trout being quickly captured by anglers. FV have submitted an application for a one year extension of TEP. Bullen Merri Lake Fisheries Victoria Early 2008 Australian bass stock assessment required to complement existing data to assist with future management. Fisheries Research Branch (FRB) will develop a strategy for the frequency and extent of stock assessments on our major impoundment salmonid fisheries, in particular focusing on Bullen Merri and Purrumbete lakes. VRFish will progress negotiation with Grampians Wimmera Mallee Water on management strategies going forward with drought affected waters commencing with Fyans Lake. VRFish were supportive of Fisheries Victoria progressing the risk assessment for the stocking of estuary perch into Bolac Lake. VRFish were supportive of the fisheries management plan process. VRFish had concerns with the current restricted access by boat to Purrumbete Lake because of prevailing environmental conditions. Fisheries Victoria described the current negotiation and agency's involved in discussing future water management strategies. Options for VRFish involvement are to be progressed. Greg Fletcher presented a brief overview of environmental flows in the Wimmera River and Fishways at Halston Weir and McKenzie Creek. Jarrod Obst presented a brief overview of carp screens at Rocklands Reservoir, environmental flows and instream works such as sand barrier removal, re-snagging and riparian protection. AB - Australian bass, BT – Brown trout, CF – Catfish, CS – Chinook salmon, GP – Golden perch, MC – Murray cod, RT – Rainbow trout, SP – Silver perch, TC – Trout cod. Fisheries Victoria stocks approximately 1 million native and salmonid fish per annum into public waters throughout Victoria for recreational fishing purposes. This policy provides guidance in the setting of priorities for stocking of Victorian waters. Annual stocking plans are developed through a consultative process known as CONS, involving representatives from Fisheries Victoria Fisheries Victoria the Victorian Recreational Fishing Peak Body (VRFish), Water Management Authorities, Catchment Management Authorities (CMAs), the Department of Sustainability and Environment (DSE), and other relevant stakeholders The CONS process nominates waters to be stocked, species composition, numbers, size, timing and priority for each water. Actual numbers of fish stocked may vary from those nominated in response to environmental or other factors. Guarantee Act (FFG) 1995 or the Environment Protection and Biodiversity Conservation (EPBC) Act 1999). This is consistent with the Guidelines for Assessing Translocations of Live Aquatic Organisms in Victoria (2003). This policy defines the principles and criteria used by Fisheries Victoria when prioritising waters in the recreational fish stocking program. It is intended to assist Fisheries Victoria to respond to changes in environmental conditions such as water quality and quantity, drought and bushfires, altered management practices by water and land managers, and changing stakeholder values and expectations. This policy applies to stocking in all Victorian waters except those designated as Premier Lakes, as part of the 'Go Fishing in Victoria' initiative, which is due for completion in June 2011. This policy does not apply to stocking for conservation purposes as this process is managed by the DSE..
Responsibility for securing the resource is shared with other agencies such as DSE, water and land management agencies and CMAs. Matters not under the control and management of Fisheries Victoria include access to water storages, allocation of water flows, habitat protection/improvements or waterway health. Stocking is conducted in accordance with annual native and salmonid stocking plans. The stocking plans are developed utilising information from a range of sources, including advice provided by the CONS process. Angler access- general authorisation by the water and/or land manager to allow fishing activities taking into considering any restrictions such as fishing methods, areas and methods of entry and times. Angler popularity- An assessment of how important the water is considered in both local and regional context, not necessarily based purely on numbers of visitors but how highly it is valued by anglers. CONS – Regional Fisheries Consultation meetings held annually that determine annual stocking plans and nominate stock assessments to be undertaken..
Conservation purposes - A need to maintain or enhance populations of threatened or endangered species through stock enhancement. Endemic species – species unique to a defined place or region. Family Fishing Lake – small lake, impoundment or retarding basin generally less than 3 ha in area. These waters are stocked with rainbow trout prior to second and/or third term school holidays or Fishing Week events to provide angling opportunities for junior anglers, families and people with limited mobility. Inland fishery – one conducted in inland waters. Inland waters, as defined in the Fisheries Act, include all waterways, public dams, swamps, billabongs and lakes other than the Gippsland Lakes, Lake Tyers, Mallacoota Lake and Wingan Inlet. It does not include any water or waters on private property. Location infrastructure – describes the locations capacity to cater for a variety of fishing methods and abilities, and the facilities available i.e. boat ramps, fishing platforms, all purpose access, toilets, liberation truck access etc. Native species – fish species that naturally occurs within Victoria. Premier Lakes – part of the 'Go Fishing in Victoria' initiative and include Lillydale Lake, Lake Jubilee (Daylesford), Hyland Lake, Eildon Pondage and Kennington Reservoir. These waters are stocked more frequently and with larger fish. Premier Rivers – are part of the 'Go Fishing in Victoria' initiative. These waters are not stocked as part of the initiative. Productivity- refers to a particular waters capacity to produce and sustain healthy populations of fish. Stocking – is a subset of translocation and refers only to the release of hatchery-reared fish. Translocation protocols – protocols prepared under the 'Guidelines for Translocations of Live Aquatic Organisms in Victoria' relevant to stocking. d) The translocation is in accordance with translocation guidelines, including relevant policies. e) The increased public value outweighs the cost of stocking as evidenced through angler visitation, demand and return to anglers. Once the principles for stocking of waters have been satisfied, Fisheries Victoria will then prioritise a potential stocking water according to its social value and economic return. Premier waters, Family Fishing lakes and those waters specified in Government commitments are deemed to hold high social and economic values and will be given priority in determining the Fisheries Victoria annual stocking plan. The priority for stocking other potential waters is determined by the 'Criteria for Prioritisation of Waters for Stocking'. d) Level of angler access. b) An equitable distribution of available fish is achieved across waters (this may include regional equity). Decisions to stock waters are made in a complex and changing system. To ensure that the social and economic return from stocking is maximised, assessments will be made prior to each liberation event so that the principles and criteria for stocking continue to be met. Fisheries Victoria reserves the right to vary the stocking regime accordingly. Fisheries Victoria also reserves the right to decide what fish species are to be stocked in specific waters and the size those fish are to be when released, based on suitable receiving waters. Where appropriate, consultation with stakeholders will occur prior to this decision being made. In the event that insufficient fish are available from Fisheries Victoria hatcheries, additional fish may be sourced from private or interstate hatcheries, subject to meeting translocation policies. A reporting series of Fisheries Victoria. Results of the diary creel survey for the 1961/62 fishing season in Victoria. D Hume. October 1991. 1989 Consultations with Regions on Fish Stocking, Fish Survey and other Freshwater Fisheries Management Issues. July 1989. J Johnstone and C Barnham. Survey of Opinion on Trout Fishery Regulation - 1989. March 1990. C Barnham & B Tunbridge. (30-P) - Principal Report. (30-S) - Supplementary Report. A Summary of Trout Management Group Fish Population Surveys 1989. January 1990. A Baxter, S Vallis and C Barnham. Report on Census of Angling Clubs 1990. June 1990. C Barnham & B Tunbridge. 1990 Consultations with Regions on Fish Stocking, Fish Survey and other Freshwater Fisheries Management Issues. September 1990. B Tunbridge & C Barnham. Spiny Freshwater Crayfish Management Strategy. May 1990. J Barker. Salmonid Stocking 1989-1993: 1989 Stocking Report; 1990 Review of Stocking Plan; 1991 Stocking Plan with Notes and Instructions; 1992-93 Stocking Plans. July 1990. C Barnham & B Tunbridge. A Summary of Trout Management Group Fish Population Surveys 1990. A Baxter, S Vallis and P Quinlan. January 1991. Marine Creel Survey Report: Lorne to Bay of Islands, October 1994 to April 1995. P. Millar. June 1996. Marine Creel Survey Report: Anglesea to Bay of Islands, May 1995 to April 1997. P. Millar. February 1998. Summary of Fish Catches Taken During MaFRI Inland Fish Assessment Surveys, December 1997 – December 1998. A. Baxter. April 1999. 2002 Consultations with DNRE Regions on Fish Stocking, Fish Population Surveys and other Recreational Fisheries Management Issues. M. Ainsworth & G. Hayes. March 2002. 2003 Consultations with DPI Regions on Fish Stocking, Fish Population Surveys and other Recreational Fisheries Management Issues. M. Ainsworth & G. Jones . May 2003. 2004 Consultations with DPI Regions on Fish Stocking, Fish Population Surveys and other Recreational Fisheries Management Issues. M. Ainsworth & S. McGlashan. April 2004. 2005 Consultations with DPI Regions on Fish Stocking, Fish Population Surveys and other Recreational Fisheries Management Issues. R. Gibb. 2005. 2006 Consultations with DPI Regions on Fishing Stocking, Fish Population Surveys and other Recreational Fisheries Management Issues. R. Gibb. 2006. 2007 Consultations with DPI Regions on Fishing Stocking, Fish Population Surveys and other Recreational Fisheries Management Issues. R. Gibb. 2007.